The music of the late Phil Ochs shaped an entire generation. When he tragically took his own life in 1976, he left behind over 100 songs which continue to be performed by musicians of conscience around the world. His classics like "Changes," "There But For Fortune," and "I Ain't Marching Anymore" remain as relevant and inspiring today as they were back in the '60s. 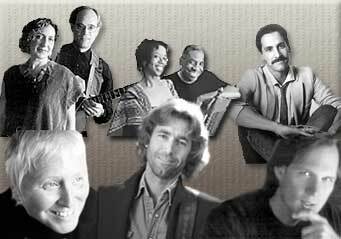 Tonight, a lineup of fabulous artists carries on the tradition by bringing Phil's music to our stage in an evening celebrating this great artist and activist. Greg Greenway's music blends the passion of Richie Havens, the lyrical guitar of James Taylor, and the rhythmic and political influences of Peter Gabriel, the Police and a wealth of Third World Artists. His debut recording, A Road Worth Walking Down, was nominated for two Boston Music Awards and is still receiving national air play. His third cd, Mussolini's Head, was released this year to very favorable reviews. He performed at Carnegie Hall in the New York Singer/Songwriter Festival which was broadcast on NPR's World Caf in 1994. Greg was born in Virginia and now makes his home on Cape Cod in Massachusetts. Kim & Reggie Harris' performances are characterized by rich harmonies, percussive guitar and a warm, upbeat presence. In 20 years of working together, they have written and sung in styles ranging from traditional to adult-contemporary. Their first cd, In the Heat of the Summer, (title song by Phil Ochs) showcases the depth and passion of their songwriting. Their first album, Music and the Underground Railroad, has been praised in musical, cultural and historical circles. A large part of this album has been recreated on a new cd titled Steal Away which is getting heavy airplay nationwide. Originally from Philadelphia, Kim and Reggie live in upstate New York. Kris Kristofferson praises John Flynn's songwriting: "The truth is in the details; the gifts are an ear for accurate dialogue, an eye for powerful imagery and anything funny, and a heart open to surprises and the possibilities of moving the emotions." As a young father Flynn left a Nashville staff writing gig and began writing songs for his kids and for his life. These songs yielded CDs that are informed by the trademark humanity and humor that Flynn sees as the essential tools for parenthood and living. Recently the 47 year-old Delaware resident has turned his attention, and his songwriting, to the world his four children will one day inherit. It's sure to be an inspirational night, with each performer singing one of Phil's songs and one original, interspersed with plenty of anecdotes and reflections on Phil's life and legacy.